So for the last two weeks I have done almost nothing besides think about Shamrock Shakes. I don’t really know why, they have never been a thing in my past. Maybe because it has always been a thing that I always missed out on, listening to people around me missing them or talking about how you could still taste them a little in the shakes. Honestly I think the last time that I had one was in college when I happened by and they had them. So this year, after Veronica alerted me to them being actively sold, it got stuck in my head that I really needed to find a way to inject as much St. Paddy’s day ice cream drink into my body as I could. Too bad rest of the world didn’t really seem to grasp on to my joy. The first time I went to McDonald’s to pick one up the other two people with me ordered meals with sodas. They then kindly explained that they either hated it or really didn’t care, they just wanted chicken nuggets and a free ride. The second time was with Veronica; she took one sip of her’s and put it down, later my Mom would try it with a worse result (she made the “I am going to throw up” face). I enjoyed my second helping, but could tell that it was waring a little thin. Too bad that the next day I had talked several people into going out of their way to get one, thus feeling obligated to go along and get another. Less, there is a reason that Shamrock Shakes are seasonal. There is also a reason that most people don’t drink massive amounts of ice cream in any given week. These are valid and good reasons. Once there was a time when Gillman taught me to drink. It wasn’t long thereafter that I passed that knowledge on to my classmates. Today and tonight I, and my local friends, celebrate that semester. 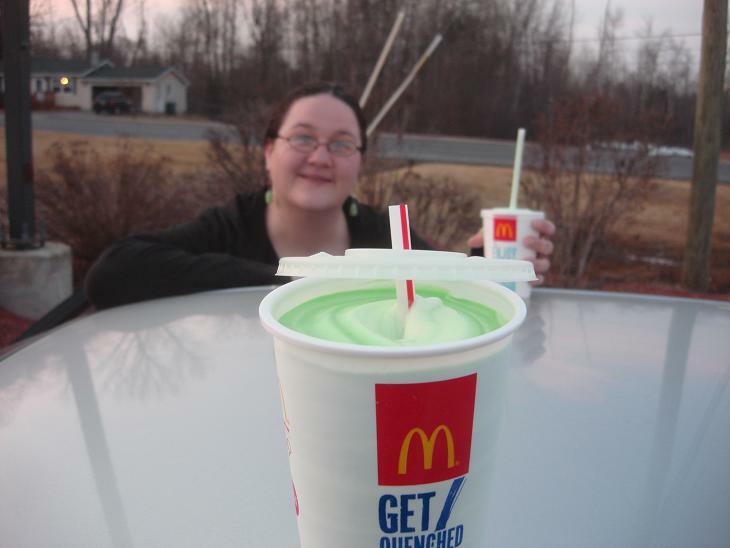 A shamrock shake might even make it onto the menu!